Preah Vihear Temple (Khmer: ប្រាសាទព្រះវិហារ Prasat Preah Vihea; Thai: ปราสาทพระวิหาร; rtgs: Prasat Phra Wihan) is an ancient Hindu temple built during the period of the Khmer Empire, that is situated atop a 525-metre (1,722 ft) cliff in the Dângrêk Mountains, in the Preah Vihear province, Cambodia. In 1962, following a lengthy dispute between Thailand and Cambodia over ownership, the International Court of Justice (ICJ) in The Hague ruled that the temple is in Cambodia. Prasat (ប្រាសាទ) in Sanskrit means ("castle", sometimes "temple"; in Sanskrit प्रासाद), and in Khmer: "phnom" (ភ្នំ) means mountain. Cambodians occasionally refer to it as "Phnom Preah Vihear" (ភ្នំព្រះវិហារ). The word "Preah" (ព្រះ) means "sacred", and the word "Vihear" (វិហារ) means "shrine" (the central structure of the temple). Thais call it "ปราสาทพระวิหาร" (Prasat Phra Wihan), meaning "Castle of Celestial Abode". The temple was built at the top of Pey Tadi, a steep cliff in the Dângrêk Mountain range which are the natural border between Thailand and Cambodia. The Temple is listed by Thailand as being in Bhumsrol village of Bueng Malu sub-district (now merged with Sao Thong Chai sub-district), in Kantharalak district of the Sisaket Province of eastern Thailand. It is 110 km from the Mueang Sisaket District, the center of Sisaket Province. 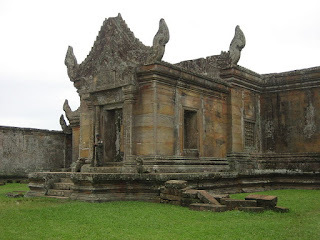 The Temple is also listed by Cambodia as being in Svay Chrum Village, Kan Tout Commune, in Choam Khsant District of Preah Vihear province of northern Cambodia. The temple is 140 km from Angkor Wat and 320 km from Phnom Penh. In 1962 the ICJ ruled that only the temple building belonged to Cambodia, while the direct way to access the temple is from Thailand. Construction of the first temple on the site began in the early 9th century; both then and in the following centuries it was dedicated to the Hindu god Shiva in his manifestations as the mountain gods Sikharesvara and Bhadresvara. The earliest surviving parts of the temple, however, date from the Koh Ker period in the early 10th century, when the empire's capital was at the city of that name. Today, elements of the Banteay Srei style of the late 10th century can be seen, but most of the temple was constructed during the reigns of the Khmer kings Suryavarman I:96–97 (1006–1050) and Suryavarman II (1113–1150). An inscription found at the temple provides a detailed account of Suryavarman II studying sacred rituals, celebrating religious festivals and making gifts, including white parasols, golden bowls and elephants, to his spiritual advisor, the aged Brahmin Divakarapandita. The Brahmin himself took an interest in the temple, according to the inscription, donating to it a golden statue of a dancing Shiva known as "Nataraja". In the wake of the decline of Hinduism in the region the site was converted to use by Buddhists. The temple complex runs 800 m (2,600 ft) along a north-south axis facing the plains to the north, from which it is now cut off by the international border. It consists essentially of a causeway and steps rising up the hill towards the sanctuary, which sits on the clifftop at the southern end of the complex (120 m or 390 ft above the northern end of the complex, 525 m or 1,722 ft above the Cambodian plain and 625 m or 2,051 ft above sea level). Although this structure is very different from the temple mountains found at Angkor, it serves the same purpose as a stylised representation of Mount Meru, the home of the gods. 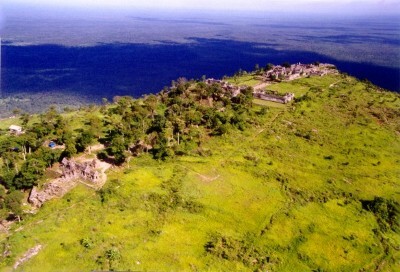 In modern times, Prasat Preah Vihear was rediscovered by the outside world and became subject of an emotional dispute between Thailand and the newly independent Cambodia. In 1904, Siam and the French colonial authorities ruling Cambodia formed a joint commission to demarcate their mutual border to largely follow the watershed line of the Dângrêk mountain range, which placed nearly all of Preah Vihear temple on Thailand's side. In 1907, after survey work, French officers drew up a map to show the border’s location. However, the resulting topographic map, which was sent to Siamese authorities and used in the 1962 (ICJ) ruling, showed the line deviating slightly from the watershed without explanation in the Preah Vihear area, placing all of the temple on the Cambodian side. Following the withdrawal of French troops from Cambodia in 1954, Thai forces occupied the temple to enforce their claim. Cambodia protested and in 1959 asked the International Court of Justice to rule that the temple and the surrounding land lay in Cambodian territory. The case became a volatile political issue in both countries. Diplomatic relations were severed, and threats of force were voiced by both governments. The court proceedings focused not on questions of cultural heritage or on which state was the successor to the Khmer Empire, but rather on Siam's supposed long-time acceptance of the 1907 map. Arguing in The Hague for Cambodia was former U.S. Secretary of State Dean Acheson, while Thailand’s legal team included a former British attorney general, Sir Frank Soskice. Cambodia contended the map showing the temple as being on Cambodian soil was the authoritative document. Thailand argued that the map was invalid and that it was not an official document of the border commission, and that it clearly violated the commission’s working principle that the border would follow the watershed line, which would place most of the temple in Thailand. If Thailand had not protested the map earlier, the Thai side said, it was because Thai authorities had had actual possession of the temple for some period of time, due to the great difficulty of scaling the steep hillside from the Cambodian side, or simply had not understood that the map was wrong. On 15 June 1962, the court ruled 9 to 3 that the temple belonged to Cambodia and, by a vote of 7 to 5, that Thailand must return any antiquities such as sculptures that it had removed from the temple. In its decision, the court noted that in over the five decades after the map was drawn, the Siamese/Thai authorities had not objected in various international forums to its depiction of the temple’s location. Nor did they object when a French colonial official received the Siamese scholar and government figure Prince Damrong at the temple in 1930 (possibly before the Thais realised the map was wrong). Thailand had accepted and benefited from other parts of the border treaty, the court ruled. With these and other acts, it said, Thailand had accepted the map and therefore Cambodia was the owner of the temple. "It was clear from the record, however, that the maps were communicated to the Siamese Government as purporting to represent the outcome of the work of delimitation; since there was no reaction on the part of the Siamese authorities, either then or for many years, they must be held to have acquiesced. The maps were moreover communicated to the Siamese members of the Mixed Commission, who said nothing, to the Siamese Minister of the Interior, Prince Damrong, who thanked the French Minister in Bangkok for them, and to the Siamese provincial governors, some of whom knew of Preah Vihear. If the Siamese authorities accepted the Annex I map without investigation, they could not now plead any error vitiating the reality of their consent. The Siamese Government and later the Thai Government had raised no query about the Annex I map prior to its negotiations with Cambodia in Bangkok in 1958. But in 1934-1935 a survey had established a divergence between the map line and the true line of the watershed, and other maps had been produced showing the Temple as being in Thailand. Thailand had nevertheless continued to also use and indeed to publish maps showing Preah Vihear as lying in Cambodia. Moreover, in the course of the negotiations for the 1925 and 1937 Franco-Siamese Treaties, which confirmed the existing frontiers, and in 1947 in Washington before the Franco-Siamese Conciliation Commission, Thailand was silent. The natural inference was that Thailand had accepted the frontier at Preah Vihear as it was drawn on the map, irrespective of its correspondence with the watershed line." Whether the Mixed Commission did or did not delimit the Dangrek, the truth, in my opinion, is that the frontier line on that mountain range is today the line of the watershed. The Court however has upheld a frontier line which is not the line of the watershed, one which in the critical area of the Temple is an entirely different one. 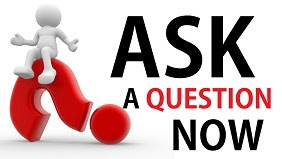 This finds its justification in the application of the concepts of recognition or acquiescence. With profound respect for the Court, I am obliged to say that in my judgment, as a result of a misapplication of these concepts and an inadmissible extension of them, territory, the sovereignty in which, both by treaty and by the decision of the body appointed under treaty to determine the frontier line, is Thailand's, now becomes vested in Cambodia. Thailand reacted angrily. It announced it would boycott meetings of the Southeast Asia Treaty Organization, with Thai officials saying this step was to protest a U.S. bias toward Cambodia in the dispute. As evidence, Thai officials cited the pro-Cambodia vote of an American judge on the court and Acheson’s role as Cambodia’s advocate; the U.S. government replied that Acheson was merely acting as a private attorney, engaged by Cambodia. Mass demonstrations were staged in Thailand protesting the ruling. Thailand eventually backed down and agreed to turn the site over to Cambodia. Rather than lower the Thai national flag that had been flying at the temple, Thai soldiers dug up and removed the pole with it still flying. The pole was erected at nearby Mor I Daeng cliff, where it is still in use. In January 1963, Cambodia formally took possession of the site in a ceremony attended by around 1,000 people, many of whom had made the arduous climb up the cliff from the Cambodian side. Prince Sihanouk, Cambodia’s leader, walked up the cliff in less than an hour, then made offerings to Buddhist monks. He made a gesture of conciliation in the ceremony, announcing that all Thais would be able to visit the temple without visas, and that Thailand was free to keep any antiquities it may have taken away from the site. Civil war began in Cambodia in 1970; the temple's location high atop a cliff served to make it readily defensible militarily. Soldiers loyal to the Lon Nol government in Phnom Penh continued to hold it long after the plain below fell to communist forces. Tourists were able to visit from the Thai side during the war. Even though the Khmer Rouge captured Phnom Penh in April 1975, the Khmer National Armed Forces soldiers at Preah Vihear continued to hold out after the collapse of the Khmer Republic government. The Khmer Rouge made several unsuccessful attempts to capture the temple, then finally succeeded on May 22, 1975 by shelling the cliff, scaling it and routing the defenders, Thai officials reported at the time. The defenders simply stepped across the border and surrendered to Thai authorities. It was said to be the last place in Cambodia to fall to the Khmer Rouge. Full-scale war began again in Cambodia in December 1978 when the Vietnamese army invaded to overthrow the Khmer Rouge. Khmer Rouge troops retreated to border areas. In January, the Vietnamese reportedly attacked Khmer Rouge troops holed up in the temple, but there were no reports of damage to it. Large numbers of Cambodian refugees entered Thailand after the invasion. Guerrilla warfare continued in Cambodia through the 1980s and well into the 1990s, hampering access to Preah Vihear. The temple opened briefly to the public in 1992, only to be re-occupied the following year by Khmer Rouge fighters. In December 1998, the temple was the scene of negotiations by which several hundred Khmer Rouge soldiers, said to be the guerrilla movement's last significant force, agreed to surrender to the Phnom Penh government. The temple opened again to visitors from the Thai side at the end of 1998; Cambodia completed the construction of a long-awaited access road up the cliff in 2003. On June 12, 1979, the government of General Kriangsak Chomanan, who had come to power in Thailand by a military coup, informed foreign embassies in Bangkok that it was going to expel a large number of Cambodian refugees. He would allow the governments of the United States, France, and Australia to select 1,200 of the refugees to resettle in their countries. Lionel Rosenblatt, Refugee Coordinator of the American Embassy, Yvette Pierpaoli, a French businesswoman in Bangkok, and representatives of the Australian and French governments rushed to the border to select the refugees that night. In three frantic hours the foreigners picked out 1,200 refugees for resettlement from among the thousands being held by Thai soldiers behind barbed wire in a Buddhist temple at Nong Chan Refugee Camp and loaded them on buses to go to Bangkok. The remaining refugees were then loaded on buses and sent away, their destination unknown. It later became known that Cambodian refugees had been collected from many locations and sent to Preah Vihear. An American Embassy official stood beneath a tree along a dirt road leading to the temple, counted the buses, and estimated that about 42,000 Cambodians were taken to Preah Vihear. At the foot of the cliffs were minefields, placed by the Khmer Rouge during their rule in Cambodia. The refugees followed a narrow path, the safe route indicated by the bodies of those who had set off land mines. They used the bodies as stepping stones to cross the three miles of mined land to reach the Vietnamese soldiers, occupiers of Cambodia, on the other side. The United Nations High Commissioner for Refugees later estimated that as many as 3,000 Cambodians had died in the push-back and another 7,000 were unaccounted for. General Kriangsak's objective in this brutal operation apparently was to demonstrate to the international community that his government would not bear alone the burden of hundreds of thousands of Cambodian refugees. If so, it worked. For the next dozen years the UN and Western countries would pay for the upkeep of Cambodian refugees in Thailand, resettling thousands in other countries, and devising means by which Cambodians could return safely to their own country. Following this, both Cambodia and Thailand were in full agreement that Preah Vihear Temple had "Outstanding Universal Value" and should be inscribed on the World Heritage List as soon as possible. The two nations agreed that Cambodia should propose the site for formal inscription on the World Heritage List at the 32nd session of the World Heritage Committee in 2008 with the active support of Thailand. This led to a redrawing of the map of the area for proposed inscription, leaving only the temple and its immediate environs. However, Thailand's political opposition launched an attack on this revised plan (see Modern History and Ownership Dispute), claiming the inclusion of Preah Vihear could nevertheless "consume" the overlapping disputed area near the temple. In response to the political pressure at home, the Thai government withdrew its formal support for the listing of Preah Vihear Temple as a World Heritage site. The renewed national boundary dispute since 2008 has been a reminder that despite the World Heritage ideals of conservation for all humanity, operating a World Heritage site often requires use of national authority at odds with the local cultures and natural diversity of the landscape. Prior to the listing, Cambodia considered Preah Vihear to be part of a Protected Landscape (IUCN category V), defined as "Nationally significant natural and semi-natural landscapes which must be maintained to provide opportunities for recreation." However, Category V is generally defined as "Land, with coast and seas as appropriate, where the interaction of people and nature over time has produced an area of distinct character with significant aesthetic, cultural and/or ecological value, and often with high biological diversity. Safeguarding the integrity of this traditional interaction is vital to the protection, maintenance and evolution of such an area." A luxury tour that takes travellers camping on temple sites, crossing the border into Thailand issues a warning to travellers on the possibility of a 're-routing' of the itinerary. During the People's Alliance for Democracy's seizure of Suvarnabhumi Airport, future Thai Foreign Minister Kasit Piromya reportedly called Cambodian Prime Minister in a 2008 television interview "crazy" and a "nak leng" (commonly translated as "gangster"). In 1994, Thailand held a World Heritage proposal conference in Srisaket in which local cultural traditions were considered along with monuments such as Preah Vihear that stimulate more nationalistic sentiments. The use of passes in the Dongrak Mountains reportedly tied together cultural communities and practices divided by a militarized (and imperfectly demarcated) modern border line. A Mon-Khmer ethnic minority, the Kui or Suay (the ethnonyms have multiple spellings), used the passes to hunt and capture elephants in the forests below the Dongrak cliff edge, including the Kulen area which is now a Cambodian wildlife sanctuary. Kui in Cambodia were skilled ironsmiths using ore from Phnom Dek. While elephant hunting in the vicinity of Preah Vihear was touched upon in the International Court of Justice proceedings, the World Heritage plans overlook local culture and species protection to facilitate national revenues from tourism. One international law professor has urged that practicality calls for laying aside exclusive sovereignty in favor of an "international peace park." A scholarly article concurs in concluding: "Since Thailand and Cambodia have brought only blood and bitterness to this place, it might be desirable to preserve it from both. It could be given back to nature and the indigenous peoples, to be managed cooperatively between the two governments in equal partnership with local communities, as a transborder Protected Landscape-Anthropological Reserve (IUCN category V and old category VII)." Given the massing troops in 2008, perhaps such a transborder reserve would create not only a demilitarized buffer zone in which any future demarcation can be amicably undertaken, but a recognition of the added ecological and cultural aspects of an area which both Cambodia and Thailand may still save from the destructive and exploitative impacts of rapid development so often suffered in other ASEAN countries. The conflict between Cambodia and Thailand over land adjoining the site has led to periodic outbreaks of violence. A military clash occurred in October 2008. In April 2009, 66 stones at the temple allegedly were damaged by Thai soldiers firing across the border. In February 2010, the Cambodian government filed a formal letter of complaint with Google Maps for depicting the natural watershed as the international border instead of the line shown on the 1907 French map used by the International Court of Justice in 1962. In February 2011, when Thai officials were in Cambodia negotiating the dispute, Thai and Cambodian troops clashed, resulting in injuries and deaths on both sides. Artillery bombardment in the area occurred during the conflict. The Cambodian government has claimed that damage occurred to the temple. However, a UNESCO mission to the site to determine the extent of the damage indicates that the destruction is a result of both Cambodian and Thai gunfire. Since February 4, both sides have used artillery against each other, and both blame the other for starting the violence. On February 5, Cambodia had formally complained in a letter to the U.N. "The recent Thai military actions violate the 1991 Paris Peace Accord, U.N. Charter and a 1962 judgment from the International Court of Justice", the letter claims. On February 6, the Cambodian government claimed that the temple had been damaged. Cambodia's military commander said: "A wing of our Preah Vihear temple has collapsed as a direct result of the Thai artillery bombardment". However, Thai sources spoke only of minor damage, claiming that Cambodian soldiers had fired from within the temple. An UNESCO World Heritage convention held in Paris in June 2011 determined to accept Cambodia's management proposal for the temple. As a consequence, Thailand withdrew from the event, with the Thai representative explaining, "We withdraw to say we do not accept any decision from this meeting." Following a February 2011 request from Cambodia for Thai military forces to be ordered out of the area, judges of the International Court of Justice (ICJ) by a vote of 11–5 ordered that both countries immediately withdraw their military forces, and further imposed restrictions on their police forces. The court said this order would not prejudice any final ruling on the where the border in the area between Thailand and Cambodia should fall. Abhisit Vejjajiva said that Thai soldiers would not pull out from the disputed area until the military of both countries agree on the mutual withdrawal. "It depends on the two sides to come together and talk," he said, suggesting that an existing joint border committee would be the appropriate place to plan a coordinated pullback.The ICJ ruled on 11 November 2013 that the land adjacent to the temple on the east and west (south being previously agreed as Cambodian, north as Thai) belongs to Cambodia and that any Thai security forces still in that area should leave. From Cambodia, the temple can be approached either by Tbeng Meanchey in Preah Vihear province or from Siem Reap in Siem Reap province via Anlong Veng. Although the highway is paved when it leaves Siem Reap, both roads are (occasionally) graded gravel once they begin to approach the Dangrek escarpment. It can be approached more easily from Thailand. The approach is from Kantharalak district (amphoe) of Sisaket province. Cambodia allows day-trip access to the temple from Thailand on a visa-free basis. Cambodia has periodically cut off access from Thailand during times of dispute with the Thai government.